Crypto Power Chlorella is nature's perfect and wholly balanced nutrition and systemic detoxification food supplement. Crypto Chlorella is a unique strain of 95% digestible, green, single-cell, soft cell chlorella that also contains the blue pigment, phycocyanin. Crypto Power Chlorella also contains a significant amount of all three naturally occurring alpha, beta and gamma PPARs. Peroxisome Proliferator Activated Receptors. While you are living, no matter what age, you should be free of pain and have a sense of strength and of good health, so that your life feels worth living. The foods you take into your body have to be transmuted into life, health and happiness. When all of your energies are in harmony with nature's healthy foods, your body becomes disease resistant, self-repairing, self-rejuvenating and toxin free. You have to realize that your choice of foods has a powerful influence on your illness or health. Good foods nourish and support your body, mind and spirit. Without the right choice of foods, your mental life and your spiritual life can become as distorted and out of balance as your physical health. Some people refuse to believe this food-health connection exists. Habitual poor eating patterns and poor food choices can be difficult and stressful to break. You do not receive health as a gift, you earn it and it takes work to maintain it. A big part of health is correct nutrition. Nutrition plays an extremely important role on your path to good health. When you find that you are often tired, depressed and sick, in reality nature is giving you an opportunity to discover a better way of life. The origin of chronic disease is linked to three basic processes: first the lack of needed nutritional elements, second the accumulation of toxic substances in the body and third the weakening of your natural immune system. Fatigue, frequent illness and mental depression are signals from the body telling you there is something wrong with the way you are living, starting with the food choices you are making. Good nutrition is your first stepping stone to health. You should eat whole, pure and natural foods which can build new tissue for your body and avoid foods that tear your body down. Just as good food choices can make you healthy, poor food choices can make you sick and susceptible to disease. There are foods that can heal you and there are foods that can kill you. Some of them quickly and some of them slowly. To achieve your best results, it is recommended to take a minimum of 10-15 tablets in the morning and 10-15 tablets in the evening with plenty of water or apple juice. Once your health goals have been achieved, a reduction to 5-10 tablets twice a day should be sufficient. If the product is taken regularly as recommended - you may feel healthier after 2 weeks and good results will be achieved within and up to 120 days. * Results, however, will vary with your diet and lifestyle. The elimination of toxic substances from your bowel is a very important factor in achieving health. * In most cases, foul smelling feces will leave your colon during the first 2 to 3 days after taking Crypto Power chlorella. Crypto Chlorella, is one of the highest natural sources of chlorophyll and phycocyanin. Plus, it contains an abundant variety of micro nutrients not found in any other chlorella strain, including significant amounts of all three natural alpha, beta and gamma PPARs. Peroxisome Proliferator Activated Receptors..
Other algae also have rich nutrients, however, two things that sets Crypto Power Chlorella apart from other algae are its natural PPARs Peroxisome Proliferator Activated Receptors content and its unique Crypto Chlorella Growth Factor (C.G.F.). C.G.F. is not a single substance but contains a mixture of amino acids, vitamins, sugars and peptides particularly concentrated in the nucleic acids of RNA and DNA. Crypto Chlorella, rich with PPARs, RNA and DNA, is, we believe, nature's most powerful adaptogen. Its combination of nutrients, including the highest combination of chlorophyll and phycocyanin among all known foods, make it the perfect choice for your over all health. CR-1 300 tablets of Crypto Power Chlorella. 60g. A 20 day supply. Personal Testimonies on Crypto Chlorella, Crypto Chlorella Growth Factor. Our Crypto Power USA prices are not posted on our website. Ordering Crypto Power Chlorella Products in the USA can only be done offline by phone or online through a Pay Pal invoice. If you are in the USA and would like to place an order right now or if you have a question about prices and shipping costs, please call Mike or Shoko. Toll free: 1-800-654-4394. Crypto Power Chlorella, Crypto chlorella sorokiniana has a 95% digestibility rate within two hours. The leading chlorella pyrenoidosa product, even with a special patented broken cell wall process, only delivers up to an 85% digestibility rate within five hours. (barely 70% in two hours). Crypto Power Chlorella, Crypto chlorella sorokiniana delivers up to 25% more nutrients in the first two hours than the leading chlorella product. Plus the nutritional content of Crypto Power chlorella is the most varied and richest of any of the over 20 different strains of chlorella. 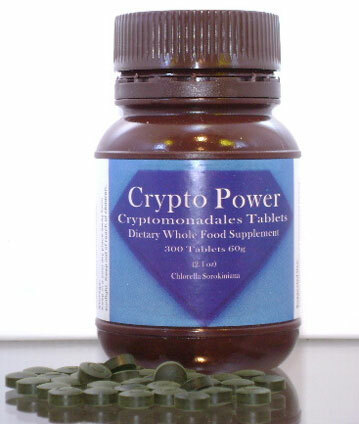 The registered international trade name for the USA brand name Crypto Power ™ Chlorella is: Cryptomonadales ® / Crypto™ Chlorella. This unique sub-species of chlorella sorokiniana is grown and processed solely by the International Chlorella Company of Taiwan. Out of over 20 different strains of chlorella, the International Chlorella Co of Taiwan is the only chlorella grower in the world cultivating 100% Cryptomonadales ® / Crypto™ chlorella sorokiniana, which is the most uniquely nutritious strain of chlorella. We know that any product is only as good as its ability to be used by the body. It's not the amount of nutrients you consume but the amount you utilize that makes the difference. Whole foods like Crypto Power ™ Chlorella (Crypto chlorella sorokiniana) ensure the highest level of digestibility (95%) and assimilation. Crypto Power ™ Chlorella, Cryptomonadales ® / Crypto™ chlorella sorokiniana, is manufactured under World Health Organization GMP (good manufacturing practice) standards and carries the seal of quality and purity from the Taiwanese department of health. Crypto Power chlorella ( Cryptomonadales ® / Crypto™ chlorella sorokiniana ) is the one supplement, we believe, which outshines anything else we've encountered for the past 20 years in our search for excellent products. It is absolutely "the best", and we strongly encourage adults and children, healthy or not-so-healthy, dogs, cats, fish and plants to take this great whole food daily. Crypto Power chlorella distributors in the U.S.A..